Microservices Meetup Berlin about Software Memories and Simulated Machines by William Louth. Berlin DevOps about Scaling Logstash: A Collection of War Stories by Pere Urbon-Bayes and "Continuous development with Nix" by Rok Garbas. Sadly there was no time for the traditional fish bowl discussion. AWS User Group Meetup about STUPS tools & components platform by Henning Jacobs and Distributed Log Refinement Discussion by Christian Kniep. Software Memories and Simulated Machines was above my head. Scaling Logstash made me wonder how many engineers you actually need to run that "properly". Nix is something we hopefully don't need, Rok actually said that if you package everything you don't need it. It contains a lot of tools that work together to solve a lot of the challanges related to running a large company on AWS. For me that was most definitively the highlight of this week. 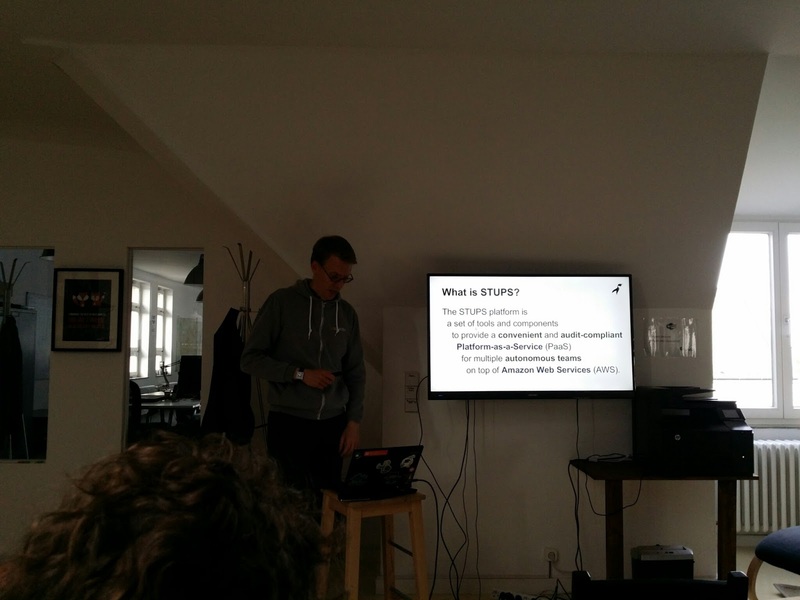 Hennig explaining STUPS at the AWS User Group.